Fourth Annual Philadelphia Interfaith Walk for Peace and Reconciliation. The 4th Interfaith Walk for Peace and Reconciliation took place in Northwest Philadelphia – Germantown and West Mount Airy – on Sunday, June 4, 2007. Rabbi George Stern, Executive Director of the Neighborhood Interfaith Movement (NIM), which sponsored the walk, said, "Four years ago there was a group introduced to this concept by Rabbi Lynn Gottlieb, who was at that time in Albuquerque. Lynn and a Muslim colleague in Albuquerque, Imam Abdul Rauf Campos-Marquetti, started a Jewish-Muslim peace march, so that the two communities could reach out to one another." Vic Compher, a long-time peace activist in Philadelphia picked up the idea, said Stern, and Compher brought Gottlieb and Campos-Marquetti to Philadelphia to organize marches. "The first three (walks)," said Stern, "were all held pretty much in town, in the Center City area. This year we decided to bring it up to Northwest Philadelphia, and Neighborhood Interfaith Movement cosponsored it. The most important thing is that they (members of different faiths) meet one another, and get to talk to people that they did not know. In each of the different venues where we stop, we’ll have prayers and readings... So it is a celebration of peace. And it is totally non-political, there are no political agendas, except that we’re in favor of peace." Mark Johnson, is the new Executive Director of the Fellowship of Reconciliation, a venerable religiously-based peace movement; "We (FOR) have about sixteen thousand members," he said, "and we regularly put out alerts, and we publish a magazine. We have a small staff located in three places, in California doing work in Columbia, in the Midwest doing work with young adults, and then in Nyack, New York, where out headquarters are…The work is focused on small groups being present like here today, as a part of a lot of people coming together." Of the walk itself, Mark Johnson said it was "delightful, this is our first chance to be a part of the peace walk. I’ve been reading about it, and talking with Rabbi Lynn Gottlieb about it for a few weeks in my new role (as Executive Director). This is a great example of what is possible and what should be happening." Aqueela Abdul Latif, a member of Masjid Muhammad, said of the walk, "I see the beauty in it. I see people of all different races and of all religious organizations coming together, and this is what we hope for. I hope that every year it’ll grow to be bigger and bigger, so we can learn about each other, understand our differences, and find out the common goal that we have to be as one, because we are one race…What’s good for our community is good for the overall community." Peter Handler, a member of Mishkan Shalom Synagogue, said, "I’ve been part of the organizing group since the first peace walk. For me this is something really important in terms of bringing (various) religions together, having traveled twice in Muslim countries, and seeing the possible communion between Jews and Muslims. I think it’s really important, particularly with the political climate in this country now, where the powers that be are trying to marginalize Muslims, that it’s important to pull people together, rather than separate us." 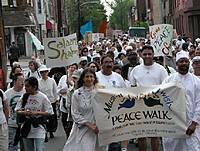 Rabbi Lynn Gottlieb, who brought the idea of the peace walk to Philadelphia, said, "We founded over sixteen peace walks throughout the United States and Canada, and we’re hoping to have a national gathering next year in Philadelphia of all the peace walk communities. It’s not often that such a diverse community gathers together. We keep ourselves pretty much secluded in our own neighborhoods, and in our own places of worship. We think it’s very important to be on the ground and to walk from neighborhood to neighborhood, and to have time together to meet each other and to learn what each other is about." Saleem Abdul Latif, a member of Masjidullah mosque, said, "Many times you get a group of people together that stand for something like peace, it’s absolutely wonderful. That brings the moral standards of other people sometimes, when they see a group of people and they want to be a part of that. Everything that’s good for the humanity, of society, is always a positive thing." Mangeet Kaur, a member of the Philadelphia Sihk Society, said of the walk, "I think it’s a great opportunity to get together as a community. With today’s world and Iraq, we need peace to survive, and it’s good to get together, to get to know each other." The program began with prayers in Masjid Muhammad, 400 East Penn Street. Patricia Coyne, of the Philadelphia Commission of Human Relations, gave instructions to the marchers. The walk proceeded to St. Vincent de Paul Roman Catholic Church, 109 East Price Street, and they were greeted by music from Sharon Katz of the group Peace Train and the choir of the Unitarian Society of Germantown. Father John Kettleberger, pastor of St. Vincent, greeted the walkers, saying, "Saint Vincent was a symbol in the Seventeenth century of charity, of reaching out in service to others. Saint Vincent de Paul Church was build in 1851, as a church of welcome for Irish immigrants, who were coming to this part of Philadelphia, who were not welcomed by the people who lived here; they were different, they were immigrants, they were strange, they had a strange religion. But this church was built to welcome them. This church continues to welcome everyone who wishes to come and praise God, who wishes to join hands with us in service to out brothers and sisters." Pecki Witonsky led the group in the Universal Greeting, which he learned from the Gandhi Foundation. Verbally and with hand gestures, Witonsky said, "I offer you peace, I offer you friendship, I offer you love, I hear your need, I see your beauty, I feel your feelings, my wisdom comes from a higher source, I salute that source in you, let us work together." The Reverend Ernest Flores, pastor of Second Baptist Church of Germantown, spoke of the crucifixion of Jesus of Nazareth, and his words from the cross, "Father, forgive them, for they know not what they do." "In this room today," said Flores, "we are representatives of faith traditions and groups of people from all over the world, who have killed each other for centuries. We have committed horrible crimes against each other throughout the years, we’ve done terrible things, unspeakable things to each other, and yet here we are together, not hating one another, not pointing fingers at one another, not blaming each other for the sins of the past, but here we are in love and respect and friendship, and acknowledgement of each other’s humanity, forgiving one another and willing to go forward. This is a miracle." Flores’ address was followed by a Loving Kindness meditation led by Dominic and Carole Roberti of the Philadelphia Buddhist Association. Vic Compher, one of the organizers of the walk, said "We are here today, all of us, upholding and making real Martin Luther King’s dream of a Beloved Community. We are here in the spirit of Gandhi, to be the change we seek in the world. We’re here to express our friendship with each other, to affirm the deepest truths of our various faiths." The walkers continued to Germantown Mennonite Church, 21 West Washington Lane, and they were greeted with music from the New Covenant Church Sanctuary Choir. Pastor Mark Schlotterbeck greeted the walkers, and Patricia Beynen spoke of the Mennonite tradition of pacifism: "We have a theological basis for our position," she said, "and we must constantly figure out how to live it out. We struggle with how to keep peace, in times of war and peace. We struggle with (resolving) interpersonal conflict, to love the person we disagree with, as much as the enemy across the world." Mangeet Kaur of the Philadelphia Sihk Society said, "This peace walk signifies the ability for all human beings, despite different beliefs, to co-exist peacefully. It signifies the common goal of people from all walks of life to live together harmoniously. We have come here today to spread a message of non-violence from the streets of Philadelphia to around the world." Dorothy Johnson-Speight, founder and director of Mothers in Charge, spoke of the shooting death of her son, and said, "That is what prompted me to start the organization, Mothers In Charge. We have mothers, grandmothers, aunts, and sisters, who have lost loved ones to violence," and she invited members of her group to stand. "Four years ago," said Johnson-Speight, "we decided to work together to establish peace in our community. It has nothing to do with race, religion, or anything like that." She introduced Ruth Donnelly, whose son was shot by the same person five months earlier. "I met Ruth," said Johnson-Spaight, "six months after her son had been murdered, and we have been side by side, working for peace since then. Violence knows no race, and it knows no religion. You must all work together for peace." She then introduced Celeste Zapalla, a peace activist who lost her son, Sherwood Baker, in action in Iraq. The walkers continued up Germantown Avenue from Hortter Street to Carpenter Street, and there was a moment of silence to commemorate people killed by violence in Philadelphia. They concluded the walk at the Germantown Jewish Centre, 400 West Ellet Street, where they were greeted by music from Atzilut Concerts for Peace, and by Rabbi Leonard Gordon. "Many of us," said Gordon, "have dressed today in white, set aside our differences, and walked together today in the service of peace. For some of us, thinking about the need for increasing peace draws our attention to wars and conflicts in foreign lands. For others, thinking about peace directs our focus to the streets of our city, and of the danger of gun violence. And for still others among us, the need for peace is manifest first in our homes, places that should provide shelter and safety, and that all too often do not." Rabbi Lyn Gottleib and Imam Abdul Rauf Campos-Marquetti spoke. "The future is in our youth," said Campos-Marquetti. "The reason for the walk is to create peace in this world, to create peace amongst us in our communities, and especially to build a better world for our children." He invited children eighteen and under to come up to the front of the sanctuary, saying, "It’s their voices that we need to hear, their voices that are shouting for peace." "Youth need to be at the table," said Gottlieb. "We can’t speak for them, they need to be speaking for themselves. I hope that next year, they are part of the planning (for the next walk), they are part of the voice, and they are sitting at the table."